This week’s sponsor giveaway comes from Natalia Cervantes who runs Fawa in Tijuana, Baja California, Mexico, along with hubby Shijune and her two year old son Junn. Her shop is stocked with lovely handmade items (do check out her hand-carved stamps and hand-painted fridge magnets!) and original paintings. 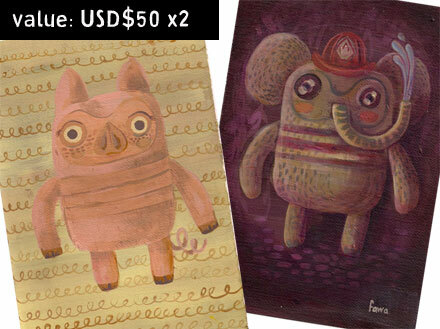 She’s giving away ONE each of her original acrylic paintings on paper to TWO lucky Pikaland readers! To be in the running, just leave your comment in this post before 2nd March, and we’ll email the winner after. UPDATE: Commenting has now closed, thanks so much for participating. The winner of this giveaway is Anita Z and Carol Gudanowski! I LOVE love love the fireman- and the pig- and the stamps at her store- thanks so much for turning me onto this! oh! They are so beautiful!!!! I love them! Count me in! oh this is awesome! i love love LOVE fawa! 😀 her cute little handmade bags & stamps are stellar, too. I love them so much!!!! love love love everything- yay! I would LOVe one! They are both fabulous! fantastic pieces. love her work! I love the little pig! very cute and very colorful! These are great! I hope I’m one of the lucky ones. my little duck and chicken friends would love to have these in their hatching/growing room. yeahhhh, it’s in my house, we spend all of our time there! Oh…did you enter my GIVEAWAY…you have 2 more hours! Love her work! It would be a fab b-day present to win one of these…fingers crossed! I love these whimsical paintings! Keeping my fingers crossed. I [heart] everything about Mexico, from the food to the people, and now these wonderful prints. I have the perfect spot for them on my wall next to a hand weaved tapestry I got in San Cristobal de Las Casas. Gorgeous imagery that is somewhat surreal. Perfect for my son’s room. Please pick me! These paintings look great! Count me in! How cute! I love the pig. I love San cristobal too!!! Nice, a fellow stampmaker. Very original stuff she makes. I would love to win a painting. great stuff, i’d love them! her work is wonderful! love the colors and characters. quirky and adorable art work!it is nice to have it as my birthday present:)love it so much. oh thats cool!, last week i enter on her blog and i loved it!! I am mad about those colors! I love this. The characters are just darling. Nothing beats hand made . . . it’s like live music. Sweet! I would really enjoy having one of these. hello elephant, i do love you so! thanks again Pikaland for sharing another great artist! I love them! and want to get it.